Around 2500BC settlers from mainland Europe brought a new skill to Britain. They were metalworkers who knew how to work with copper. Gradually, Britons learned to make objects from copper, gold and bronze. By 2100BC, Britons were mining metals. Trading ships travelled to mainland Europe carrying copper, tin and precious objects made by metalworkers. Some settlers who arrived belonged to the Beaker culture. Beaker people lived in clans led by powerful chiefs. They held religious ceremonies at stone circles, and buried their dead in circular graves. These customs became part of life in Ancient Britain. Find out how Bronze Age metalworkers made swords. Find out how Bronze Age people used different materials for different purposes. What objects did Bronze Age people make? This golden cape was found in a grave at Mold in North Wales. It is decorated with an intricate pattern. 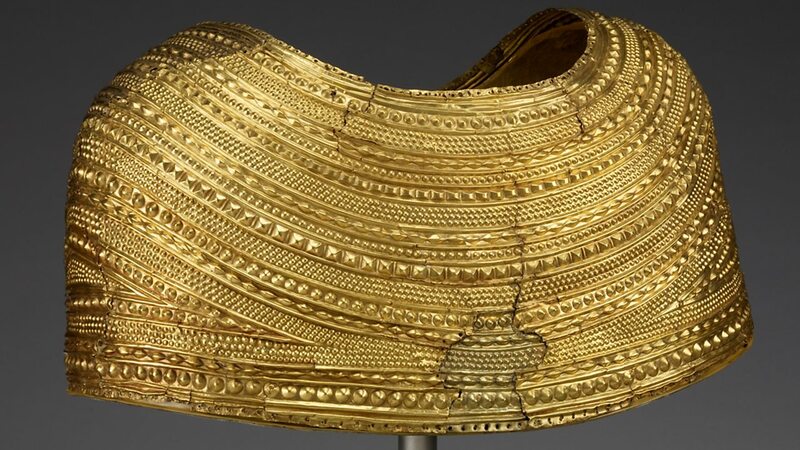 The cape is the work of a very skilled goldsmith and must have been worn by a very important person – probably a woman. 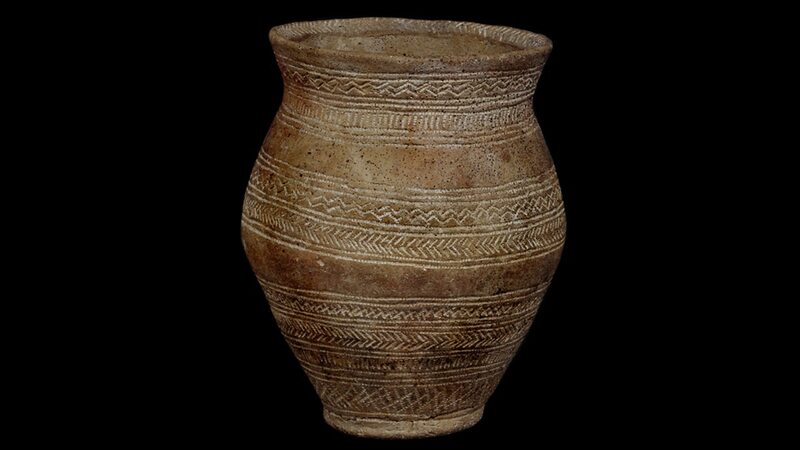 This clay beaker was found at Rudston in Yorkshire. It was made by the Beaker people. Like many Beaker pots, it is shaped like an upside-down bell and decorated with bands of geometric patterns. Pots like this were used to store grain. 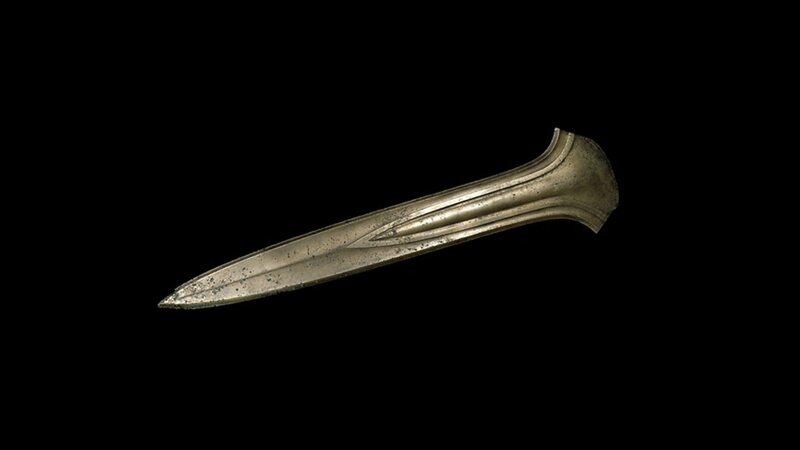 This large bronze dagger was found at Oxborough in Norfolk. At first sight, it looks very dangerous. But in fact the blade is thick and blunt. Archaeologists believe that the dagger was used by a chief as part of a ceremony. How did people travel in the Bronze Age? During the Bronze Age, many people crossed the sea from mainland Europe to Britain. They travelled in long wooden boats rowed by oarsmen. The boats carried people, animals and trading goods. They were loaded with metal from mines, precious swords, pots and jewellery. Boats were very useful for carrying heavy materials like stone. Large areas of land were covered by forest, so it was much easier to transport goods by river. By the start of the Bronze Age, people in Britain had learned to tame horses. Then, around 1000BC, they learned to make carts with wheels. Some farmers travelled on horseback or used wooden carts, pulled by horses or oxen. The first war chariots appeared at the end of the Bronze Age. Warriors rode into battle standing on chariots pulled by horses. 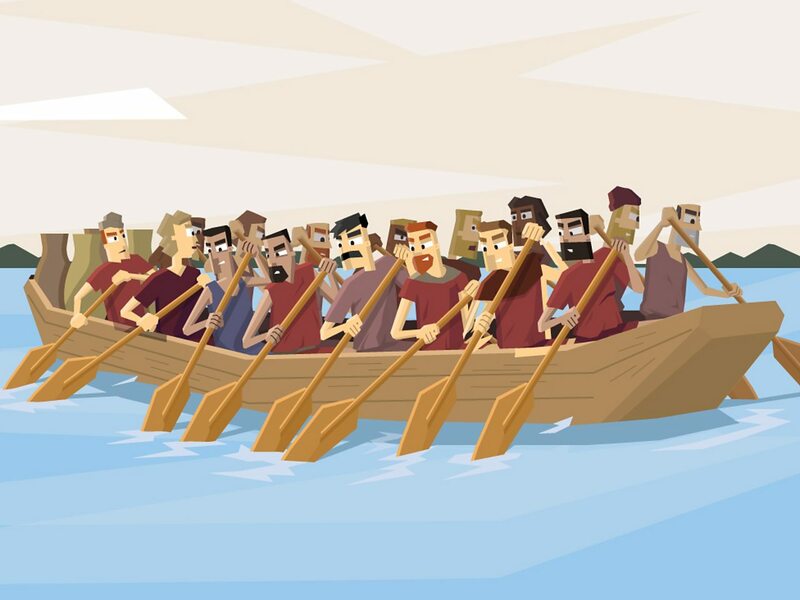 Bronze Age people crossed the sea in long wooden boats. A boat found at Dover needed 18 men to paddle it! Who was the Amesbury Archer? In 2002, archaeologists at Amesbury, in Wiltshire made an amazing find. They discovered the grave of a Bronze Age man, just two miles from Stonehenge. He was buried with around 100 objects! The people who buried him must have believed that he would use the objects in the next world. When the man was found, he was nicknamed 'the Amesbury Archer'. This was because he was buried with arrowheads and wrist-guards used by archers. In fact, the Amesbury Archer probably spent most of his time working with metal. One of the objects in his grave was a cushion stone - a tool used by metalworkers. Tests on the Archer’s skeleton show that he lived around 2300BC, grew up in the mountains of mainland Europe then travelled to England as an adult. 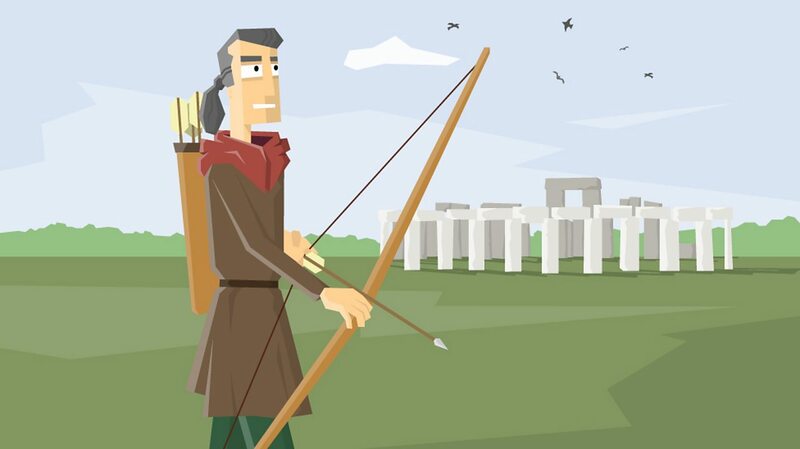 What can you learn about the Amesbury Archer from his grave?